Due to its distinct crystal formation, crystalline quartz is usually transparent. Rock crystal, amethyst, citrine, and rose quartz are well-known examples of crystalline quartz. The pale pink color of quartz is known as rose quartz and can range from transparent to translucent. The color is a very pale and delicate powder pink. 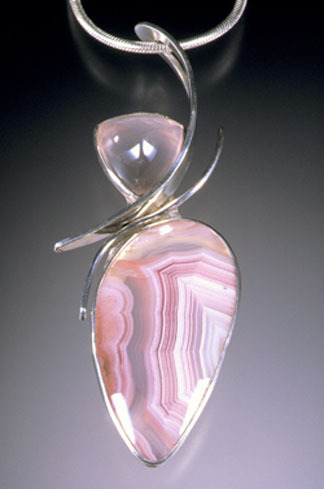 Transparent rose quartz is rare and usually so pale that it does not show much color except in larger pieces. Agates are classified as silicates which are the most abundant class of minerals. Coyamito agates are found in multiple deposits in Chihuahua, Mexico. Coyamito Ranch is the site of most of the deposits and gives its name to this usually small but beautiful agate variety characterized by colorful tight banding. This versatile piece can be worn as a pendant or as a brooch.